* I built my Stenoboard 1.1 a few nights ago, and I'm really happy with it! It writes smooth as butter, and it turns out it's slim enough to fit in the laptop sleeve of my backpack underneath my laptop, which means I now carry two steno machines with me at all times. Great for peace of mind. Emanuele has also just released a brief user manual, which explains how to switch it into different protocols, in case you want to use it with non-Plover steno software. * Since I had my Stenoboard with me during my break yesterday, I also got to try out Brent's new Android app for steno training: Speed Drill. It's really fun. Great if you only have a few minutes with your phone or tablet and want to get some training in. * For Linux users who are frustrated with Plover's handling of keyboard events (particularly ruinous in applications like Vim), there's a new fork that solves the problem. This also allows you to assign one qwerty keyboard as a Plover device and keep your regular keyboard mapped to qwerty, which is another feature people have been clamoring for. Of course we're hoping to roll this change into the main branch at some point, but I thought I should offer it as an option for now. * We now have a Wikipedia page, thanks to our recent publicity from Hacker News. It's just a stub so far, but it's a start. Feel free to flesh it out as you see fit! 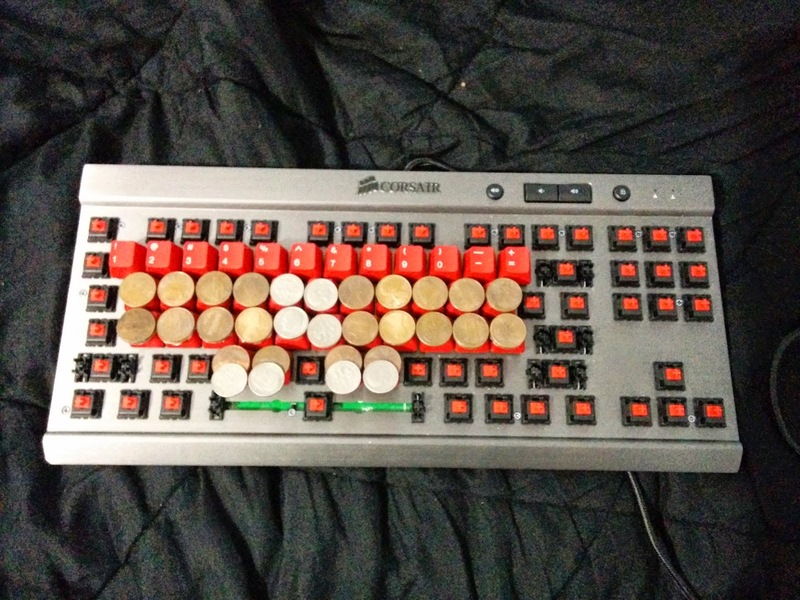 * Here's an ingenious method of making your own steno-friendly qwerty keyboard without laser-cut keytoppers from ArchZombie1y. Use coins and superglue! * If you're looking to make your own DIY keyboard and coins aren't your thing, new Plover ally Robert points out that these flat square keys from Signature Plastics look pretty ideal. "In Plover: Configure (opens Plover Configuration box), Logging, Browse (click on it), there is a file called plover with the current date and time (saves everything in that instance of Plover); right click and SAVE AS to the flash-drive memory stick being used (or CD); that's it. It gives more info than required by the testing folks at NCRA, but does give what they want. I also save the actual text file transcript to the memory stick, so there are two files on the drive." Coming soon on the Plover Blog: Results from the Plover Community Survey, a short essay on where I see amateur steno going over the next few years, and a video of me using my favorite one-stroke Plover Vim commands to make my daily captioning work a million times easier. Your talk was on hacker news and it got me really excited about plover. Do you have any thoughts on how the laser-cut keys would affect regular qwerty touch typing (i.e. during transition period)? Mirabai, how does your speed and comfort compare between StenoBoard and your professional machine? Could you really keep up at work using the StenoBoard? The key-based system of the Stenoboard requires more pressure, so I kind of have to pound it, and so both my speed and accuracy suffer noticeably, compared to my feather-light lever-based Infinity Ergonomic, but it's still not bad. Certainly as system for beginners it's definitely tolerable. I don't think I could use it professionally, though, without radically altering my writing style. Thanks, I suspected as much. My own homemade keyboard probably takes a lot more pressure too, but I don't have access to a real machine to be able to find out. Hello Mirabai, just for curiosity: is that Mark Kilingbury? Hehe, I just needed to ask that, thanks! MSI has should release a "portable" "laptop" with a mechanical keyboard soon. Its absolutely massive but may be perfect for stenography on the go. No word yet on cost or NKRO though.